Swiss watchmaker Antoine Martin has designed a watch with a 24mm balance that beats at 1 Hz – affectionately named Antoine Martin Slow Runner, and as the name suggests speed and accuracy have been completely abandoned in this aesthetically beautiful mechanical watch. Martin Braun, founder of Antoine Martin has captured the attention of the horology community with his Antoine Martin Slow Runner watch, which exhibits an immense 24mm balance wheel that beats at an astoundingly slow 1Hz – that’s one beat per second; which leaves much to be desired in the realm of time accuracy by some watch manufacturers time measuring standards. Braun’s horological design approach for Slow Runner was to visually capitalize upon the corporeal aesthetics associated with manufacturing a mechanical watch and establish a new found appreciation for an artistic slow running mechanical timepiece for a distinguished collector. The innovative artistic appeal of Slow Runner is evident through its sapphire crystal case-back which provides a view to a mechanical masterpiece of slow running time perfection. Slow Runner’s sapphire crystal case-back reveals its immense 24mm balance wheel and beautiful blue silicon hairspring which gently oscillates at 7,200 beats per hour. Antoine Martin manufacture’s choice of a silicon hairspring adds to the longevity of the watch’s movement, as silicon is resistant to deformities caused by temperature or magnetism, and makes it resistant to shocks as well. Antoine Martin Slow Runner is available in three case styles, two of which are stainless steel one with a silver dial and an anthracite dial, and the third option in rose gold with a silver dial. The 42mm by 6mm diameter case houses Antoine Martin’s exclusive manufactured AM36.001 manually wound movement which as mentioned earlier beat at 1 Hz per second for a total of 7,200 beat per hour. Antoine Martin Slow Runner seconds sub-dial slightly eclipses the hour dial which has an elaborate embossed or guilloche effect which exhibits Antoine Martin brand name and logo. The hour dial also displays Roman numerals at 2, 4, 10 and 12 o’clock with blue hour, second and indicator hands, and a date aperture window at 3 o’clock. Located at 10 o’clock is the power reserve indicator which also has a guilloche effect. The crown is engraved with Antoine Martin’s signature logo with the stainless steel versions being adorned with a black alligator leather straps, and the rose gold version being adorned with a brown alligator leather strap. Antoine Martin spared no expense or affects in the design of the Slow Runner; it is undoubtedly a slow running watch that masterfully exhibits the luxurious aesthetics of a mechanical watch. It definitely fulfills the brand’s values: Innovation, Uniqueness and the Spirit of the Times. The Girard-Perregaux, known for its traditional watchmaking and a history that spans over a century, has presented quite a unique and eccentric watch with this Girard-Perregaux Tourbillon Bi-Axial Ti-DLC watch. 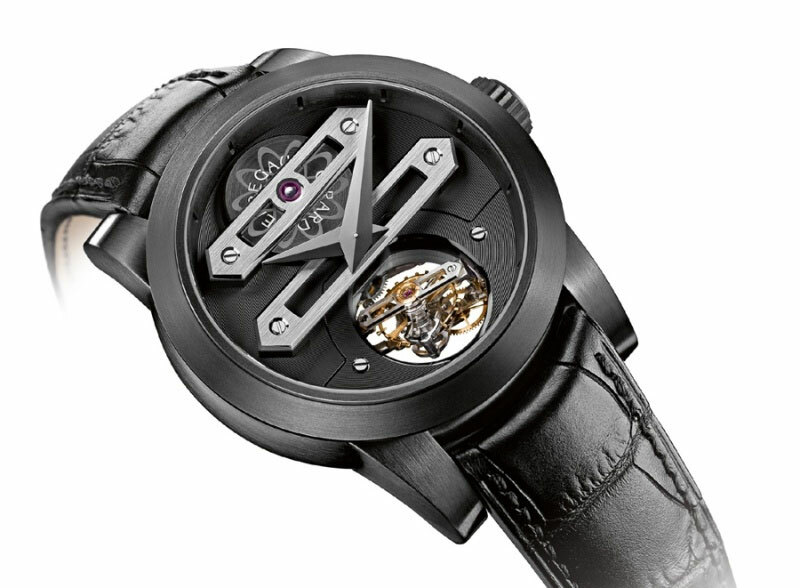 As the name suggests, this timepiece features a tourbillon that rotates around two axis. The Tourbillon Bi-Axial Ti-DLC comes in a case that measures 45 millimeters in diameter and 18.5 millimeters in height. The case is made of titanium that is treated with Diamond Like Carbon (DLC). This unconventional looking case, which combines a black DLC and main plate coating with lugs and bezel with brushed finish, houses a movement with the highest of quality. The titanium case houses the caliber GP E0201 that was developed in-house Girard-Perregaux’s workshops in La Chaux-de-Fonds. This manually wound mechanical movement runs at a frequency of 21,600 vibrations per hour (3Hz) and has 28 jewels. 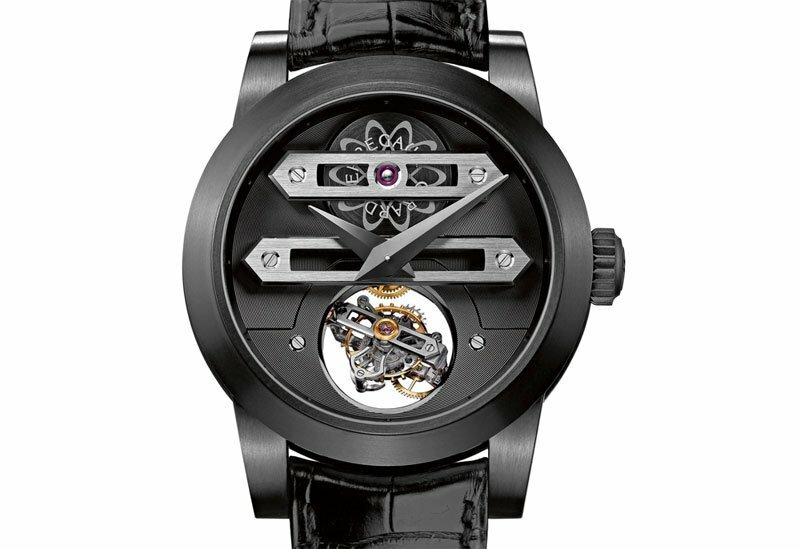 The tourbillon consists of 113 parts and weighs about a slight 0.80 grams. This tourbillon combines tow concentric cages, which are the internal and external cages. Each cage makes a full rotation in its own time. The internal cage, which bears a balance wheel, balance spring, and escapement, rotates in an external cage and this cage completes a full turn on its axis in one minute and fifteen seconds. The balance wheel with balance spring rotates inside the internal cage in 45 seconds. One full revolution is achieved in three minutes and forty-five seconds. What is cool about this watch is the movement of the tourbillon’s two cages, balance wheel and escapement on multiple axises can all be viewed and appreciated by looking at the face of the watch.